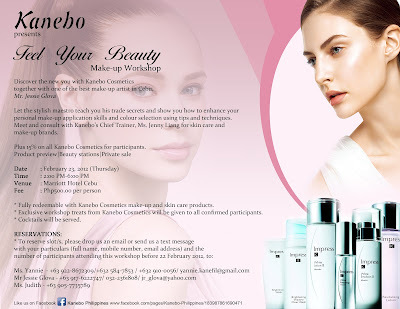 KANEBO Cosmetics brings to Cebu City "Feel Your Beauty" Make-up Workshop on Thursday, February 23, 2012 2pm to 6pm at Marriott Hotel Cebu. 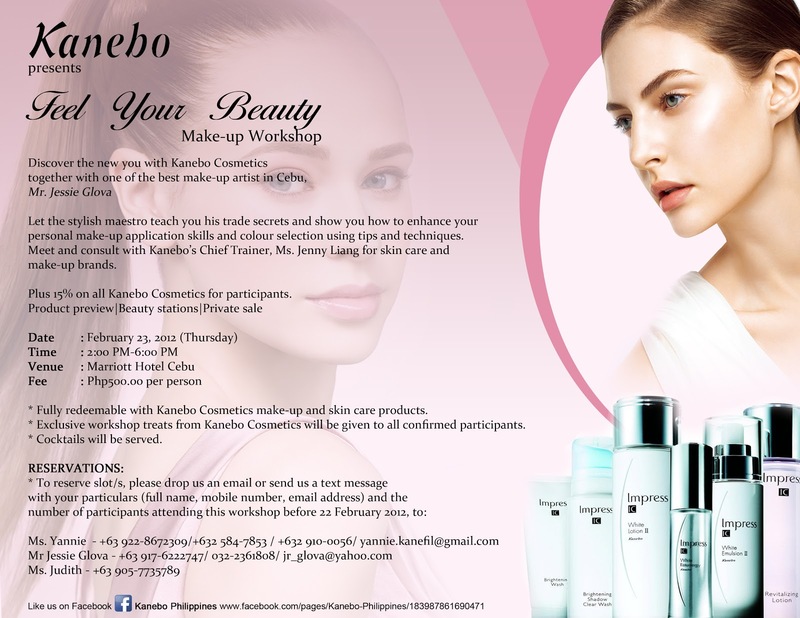 The event is a Basic Make-up Workshop of Kanebo Cosmetics with Mr. Jessie Glova from Cebu to host the entire Make-up Workshop and a Special guest from Malaysia, Kanebo's Chief Trainer, Ms. Jenny Liang. Kanebo Make-up Workshop is more on Personal Make-up 1-day training. There will be a minimum fee of P500 only which is fully redeemable with Kanebo products. All participants will receive a special treats from Kanebo. Make-up Artist will use Kanebo Cosmetics, will demo how to use the products properly. Make-up Artist will teach Day and Night Make-up. Participants should bring their own make-up tools and basic make-ups. Special guest will give brand info, skin care or make-up description to the client. A Private sale- 15% on all Kanebo Products, the P500 fee for the workshop will be deducted to the products that they will buy. All participants may pay to Mr. Jessie or Ms. Judith. KANEBO Cosmetics Second Event in Cebu this February is "The Impress Counter Promotion". A 3-day event that starts on February 24 to 26, 2012 from 12 noon until 6 pm at Rustan’s Ayala Center Cebu (Kanebo counter). 10% on all Kanebo products. Complimentary Skin Consultation with the Chief Trainer. This Kanebo Cosmetic Event is open for all. 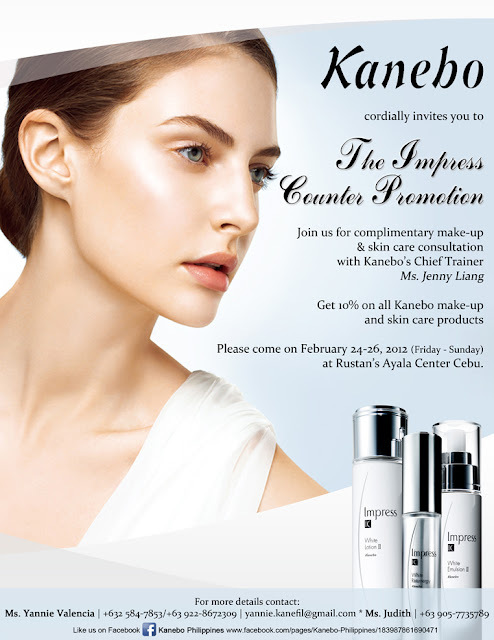 0 comments: on "KANEBO Presents 'Feel Your Beauty' Make-up Workshop to Cebu City"